I can't say why it is so popular, but it is always visited for some reason! Now I've pulled it out to repurpose it as a display rack. I never found it very functional as a glassware rack, either for out on the counter storage or as a drying rack which was its intended purpose. After a series of incidents with glasses becoming unbalanced and lotsa breakage, it was relegated to the nether world. Cute idea, but my experience was that my glassware was either too large or would not balance safely unless I stood there and watched it! 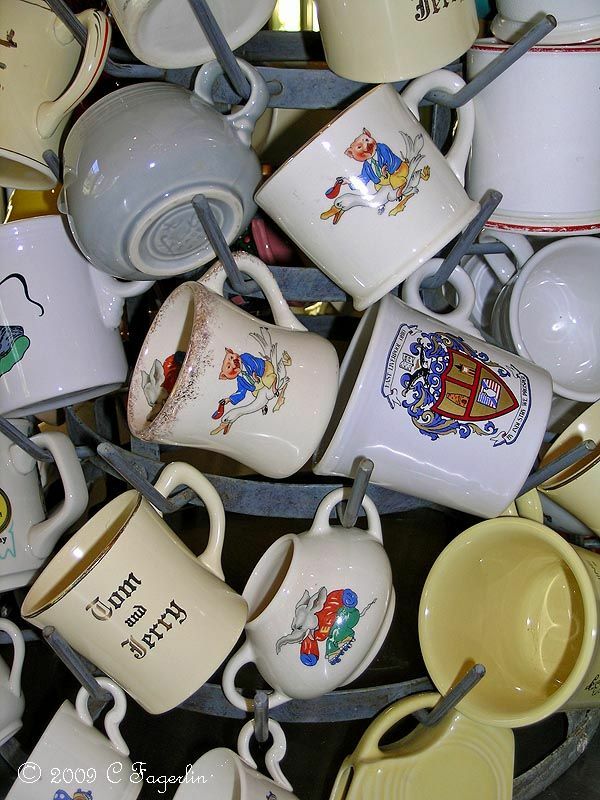 Displaying mugs and cups is always a problem for me and I have a large number of mugs, little pitchers, and children's cups/mugs that are usually languishing in a closet or box because there just is no good way to display them all. This may turn out to be a major dust magnet and a passing fancy, but for now I'm just happy to see some of these orphan mugs and cups brought out of storage and back out into the light of day. 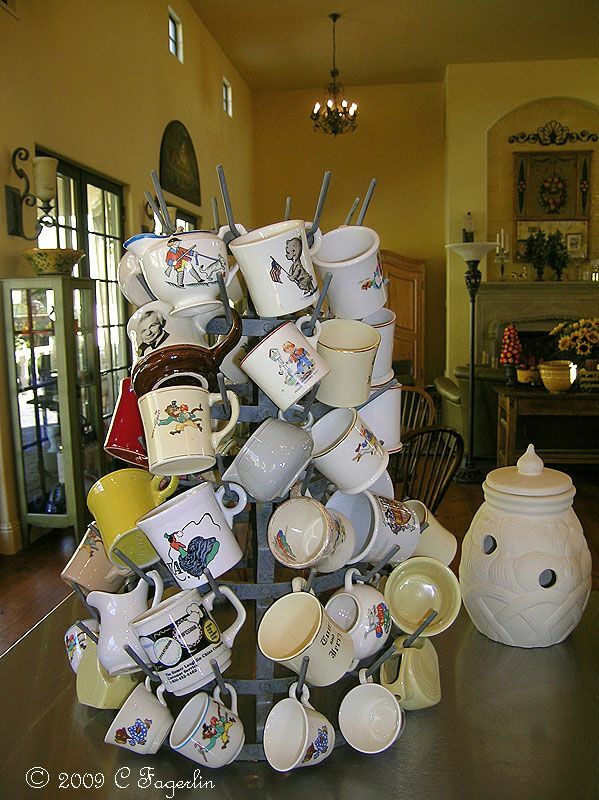 What a fun way to display souvenir mugs! Each mug tells a story. I enjoy your blog. Great photographs. I've never seen anything like this! I need to have one. love it! Love the pig riding the goose mugs!!! A fun "topper" would be a great tea or coffee pot! Put the pot of coffee on. 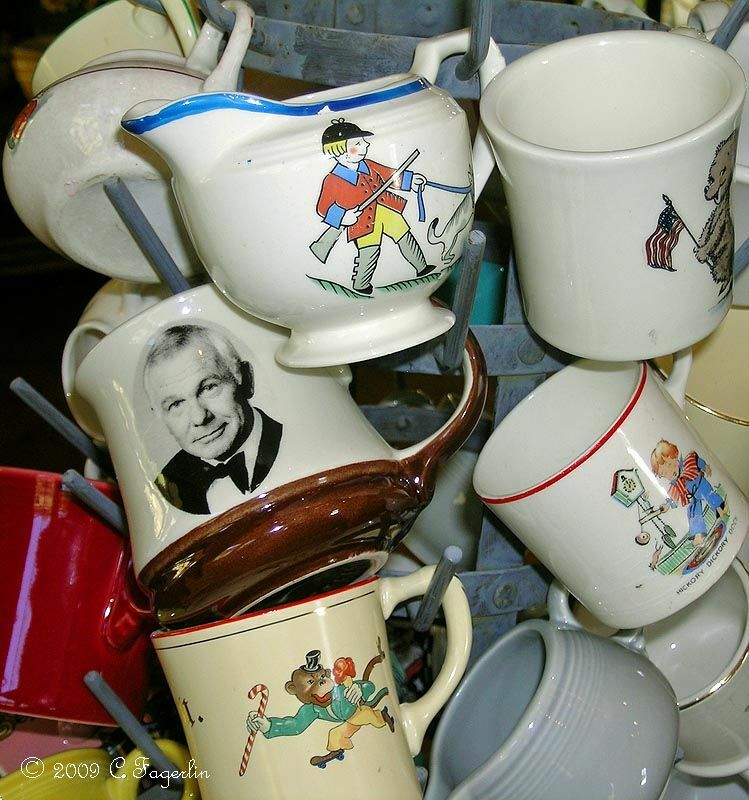 May I use the Johnny Carson mug please? That is a cute idea, and neat to see the variety here. I see some familiar ones! The Tom and Jerry mug shown on the rack goes to a generic Homer Laughlin China Tom and Jerry bowl, with its own HLC mugs. Lori - I forgot to mention that you probably picked one of the pricier of the mugs that show up in the images! ;-) These things were going for big bucks during the couple of months following Johnny's death. This is one of the mugs (made by Homer Laughlin) that was on his desk during the many years of The Tonight Show. Several different companies made these mugs over the decades he hosted the show. Now that's a fun collection and I love the rack! Super Cool! I love it. Was it a passing fancy or are you still using it? Wow!!! 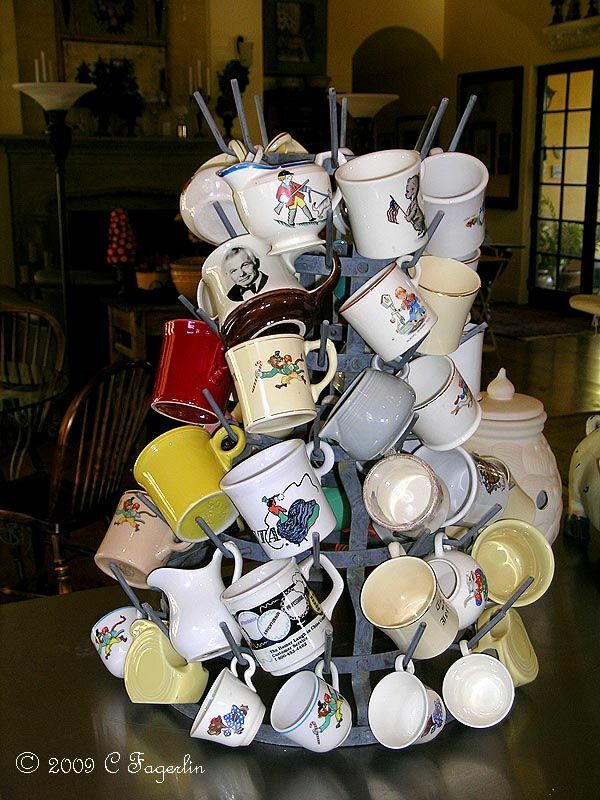 That's the biggest mug tree I've ever seen! Girl, I just had to laugh at Keetha's comment above! It truly is the biggest mug tree I've ever seen as well! Hehe! Seriously though...I love it! It's so unique and it makes such a grand statement! It really is a piece of art all in itself with all of your pretty cups!!! I love, love, LOVE IT!!! Loved looking at some of your beautiful vintage cups, creamers, etc...as well! This was a great post...I certainly can see why it is one the your most visited posts! Thank you for sharing it with us today for Sunday Favorites...such a treat!!! Hope that you're having a super Sunday, my friend! Thanks ladies, it is still in use and can be changed so easily that I'm using mugs that haven't seen the light of day for years! See you all on Sunday for another past favorite!